Nutmeg seed and Mace, the covering of the seed. Of all the known sources of spices in the world, the nutmeg is among the few plants that provide two distinct types of spices from a singular source. All three parts of the fruit are known for their narcotic and toxic effects if taken in large enough quantities, and even the aroma of the flowers is said to be intoxicating. The tree grows best under warm humid tropical conditions with an average annual rainfall of 150 cm or more, at 1,300 meters above sea level, on well-drained soil with good water retention properties. The world production of Nutmeg oil, the oil from the seeds, is estimated to average between 12,000 and 15,000 tons per year. The main countries of its production are Indonesia (75%), Grenada (20%) and in small quantities, Sri Lanka, Trinidad, China and India. Nutmeg and mace oils are unique products having wide applications in developing numerous natural value added products in flavouring of processed foods and beverages, baked foods, syrups, sweets and in perfumes. They also form an integral ingredient in male fragrances and after shave lotions in cosmetics and personal care products. They find a major place in formulations of cough syrups, herbal balms and dental creams and in pharmaceuticals too. The oils are applied externally for relief from rheumatic pain and can be applied as emergency treatment to dull toothache. They are used in the treatment of inflammations of bladder and urinary track, flatulence and insomnia. It is given in drop doses in honey for digestive upsets and used for bad breath, nausea, gastro enteritis, chronic diarrhea and indigestion. Medicinally, they are known for their stimulative and carminative properties. Massage oils can be formulated with these essential oils in combination with thyme essential oil or rosemary essential oil, for muscular pains associated with rheumatism or over exertion. They possess strong antimicrobial antifungal, anti-carcinogenic and insecticidal properties. In spite of the moderately good availability of this wonderful spice and its products, the great potential offered by these essential oils in the fields of value addition in the fields of food, perfumery, aromatherapy and pharmaceuticals haven’t been fully tapped. Considering the great opportunities it offers in the fields of foods, beverages, cosmetics, personal care products and in aromatherapy, whatever has been done to explore the full potential of this wonderful spice sin these fields do not justify the real potential it holds. Much work needs to be done to fully release the countless opportunities this wonder spice holds. Bhoomi offers Nutmeg essential oil and Nutmeg extract of Indian origin. 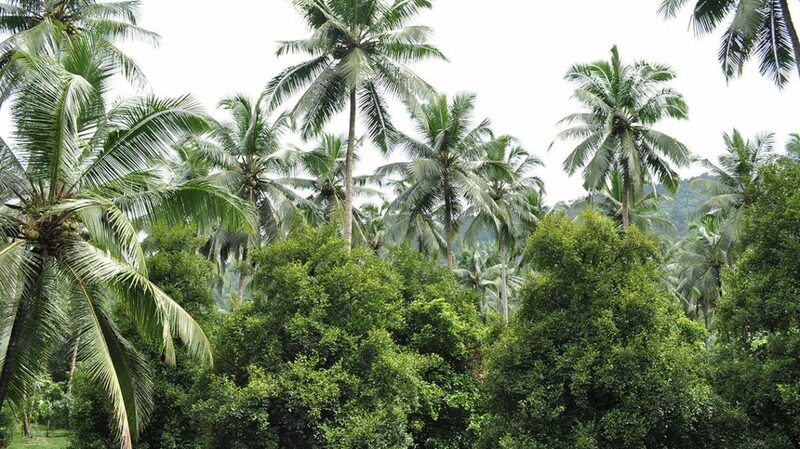 Located amidst nutmeg plantations and one of the main growing locations of Nutmeg, our facility procures raw material for production from the neighborhood and thereby, supports the local community of small landholders and planters of this wonderful spice.